Take a look at the Vatican Website's layout of the programme. This would be a punishing schedule for a man in his prime giving talks to easy audiences. For the Holy Father to undertake this series of events in the highly-charged atmosphere of the Holy Land, knowing that any slip will be mercilessly punished by the world's media, is heroic indeed. 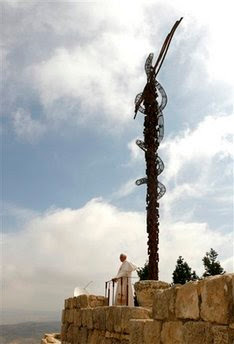 Yesterday and today, he has spoken at a welcoming ceremony at the Queen Alia airport in Amman, and then given an address while visiting the Regina Pacis centre, paid a courtesy visit to the King and Queen of Jordan, given an address while visiting the basilica of the memorial of Moses on Mount Nebo, spoken again at the blessing of the cornerstone of Madaba University of the Latin Patriarchate, visited the Hashemite museum and the Al-Hussein Bin Talal Mosque in Amman, and given an address at a meeting with Muslim religious leaders, members of the Diplomatic Corps and Rectors of universities in Jordan in front of the mosque al-Hussein bin Talal in Amman. This evening he gave another address at the celebration of Vespers with priests and religious, seminarians and ecclesial movements in the Greek-Melkite Cathedral of Saint-Georges in Amman. Deep breath! Two days down, only six more to go. The Vatican's Pilgrimage Programme page has regular updates with links to his addresses. 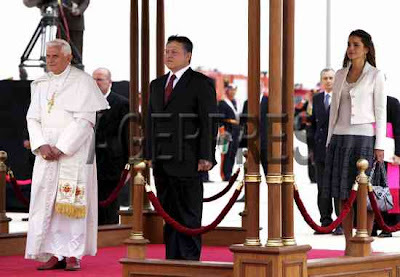 The Catholic Herald has a portal for the visit and EWTN has a special section for coverage of the visit. One interesting snippet is that Queen Rania of Jordan has been posting on Twitter and has her own YouTube channel.